I’m used to seeing cities from the bottom up. Everything from where we normally stand seems impossibly big. So naturally, my mind is blown away when I see cities from far above and realize how tiny they look. Whenever I get on a place I get a glimpse of this out of the window of a plane, but now, in the age of aerial photography, the best glimpses one gets from the tininess of our civilization come through the lens of a camera. So the first thing I do when I arrive in a new place is find the highest vantage point to view the city or region from above. This was no exception on my two visits to Paris. Paris is a relatively flat city and is great for walking. However with this comes a downside. You don’t get those sassy views you might get in more hilly cities as you’re out and about exploring. 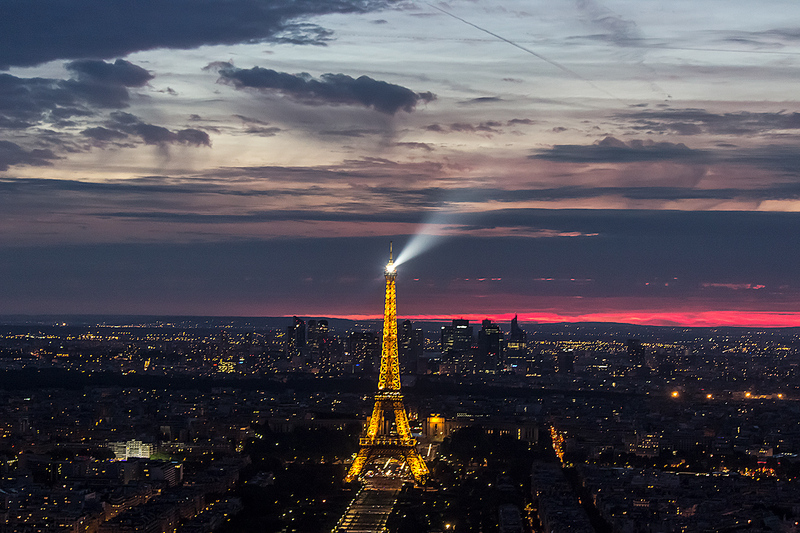 So my mission during my visits to Paris was to find as many vantage points from above as I could. And let me tell you, there are so many great places across the city where you can take a lift or climb a few hundred thigh-burning steps to get above the city for remarkable views. There are two ways to get to the top of the world’s most iconic tower. For the daring or those on a budget you can climb the 704 steps to the second level and choose to stay there or to go to the very top take the elevator. For those who don’t mind paying a few Euros or for those who refuse to take that many steps, you can get the lift to level’s one and/or two and then change lifts to get to the third level. The lift entrance ticket to the top is €17,00 and very worth it, especially if you are under time or physical constraints. If you do plan to take the lift, however, I recommend pre-booking your tickets well in advanced to avoid queues of 2 hours or more. An even better option however, is purchasing a Paris City Pass and then pay a €15 supplement to get skip-the-line access to the second floor of the Eiffel Tower: the perfect solution if you want to visit the most iconic monument in Paris without having to wait in line for ages. In order to appreciate this magnificent view you will have to arrive to the Notre Dame Cathedral first thing in the morning — preferable no later than 8 am. Head around to the left from the main entrance to an entryway that takes you up above the cathedral. Unlike the Eiffel Tower, there’s no lift here so you’ll have to walk up the 387 steps that take you to the top of the tower. But don’t be discouraged, every step you take will totally worth it! Not only is this a lovely spot for views looking west over the city and up the Seine, this also gives you an amazing up close look at the top of and decoration on the cathedral itself. 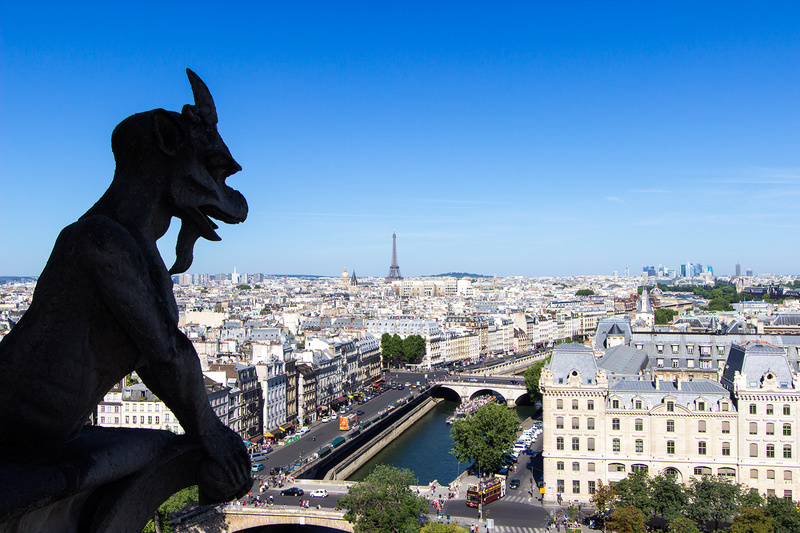 You can come face to face with the gargoyles that guard the cathedral and see the intricate detailing on the spires. October 1 to March 31: Open daily from 10 a.m. to 5:30 p.m.
Closed: January 1, May 1, December 25. Notes: Occasionally the viewing platform on top of the south tower will be closed (a sign will be posted), but a visit to the main gallery level and belfry is still worthwhile. Ticket prices are reasonable; see the cathedral’s website for current rates. Children under 18 are free. Admission is free with the Paris Museum Pass, but you’ll still have to wait in line with ticket buyers. Notre Dame is on the Ile de la Cité, the oldest and most central part of Paris. The closest Métro stop is Cité, on Line 4, and the closest RER stop is St-Michel (Lines B and C). Other Métro stations and bus stops are nearby; consult your Paris map for details. This is Paris tallest skyscraper and it offers magnificent 360º views from the open air top floor viewing platform which is open day and night. If you visit during the day you can see the planes taking off at Orly Airport and at night is the perfect vantage point to watch the Eiffel Tower put on its hourly sparkle show. 20,000 lights will flash on and off during the first 5 minutes of each hour after nightfall until 2 am in the summer and 1 am in the winter. I recommend you get there a little before sunset to get a good spot to take photos and to see the city in day light, as the sun goes down and when night falls. 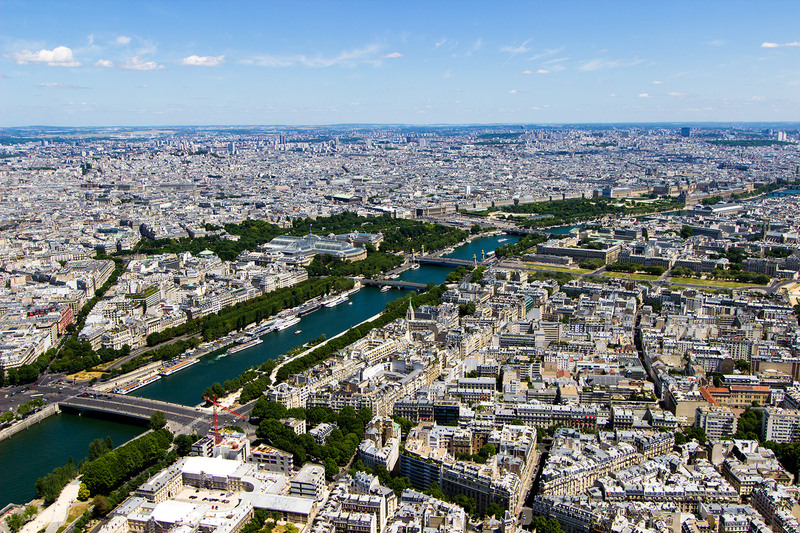 And don’t worry about climbing stairs for this fantastic view, simply head to the 15th arrondissement to take the lift to the 59th floor of the Montparnasse Tower. The best way to get to Sacre Coeur is from the bottom of the zig-zag steps in Square Louise Michel in front of the Cathedral. It is 222 steps from top to bottom or you can take the easy way by riding the funicular to the left of the steps. There’s a decent view the front of the Cathedral, but for an even better one head up into the dome. The entrance is outside the cathedral to the left and you’ll have 300 steps to climb to get to the top. 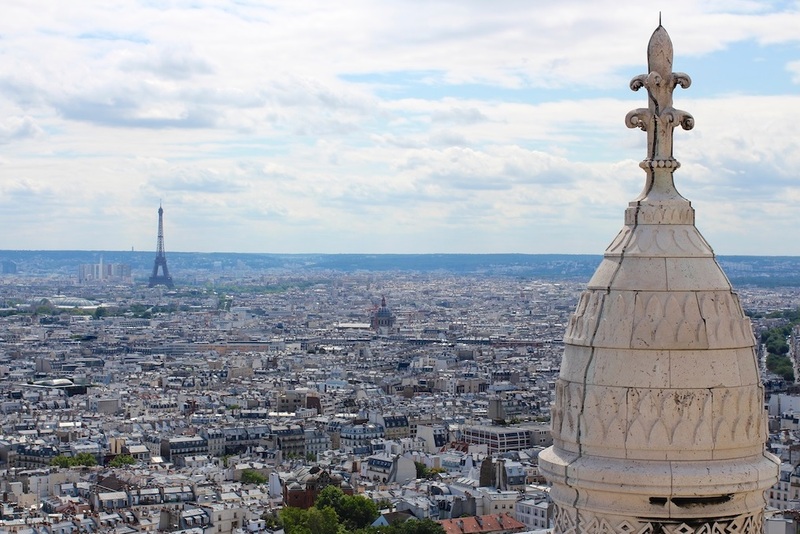 Whether you decide to stay in front of the Cathedral or climb the extra 300 steps into the dome, the views over Paris from one of the city’s very few hills are wonderful. Even on a hazy day you can see how the city sprawls out in front of you with its most well-known landmarks. The Arc’s unique position in the middle of twelve intersecting avenues makes this spot one of the most photographed views Paris after the Montparnasse Tower. 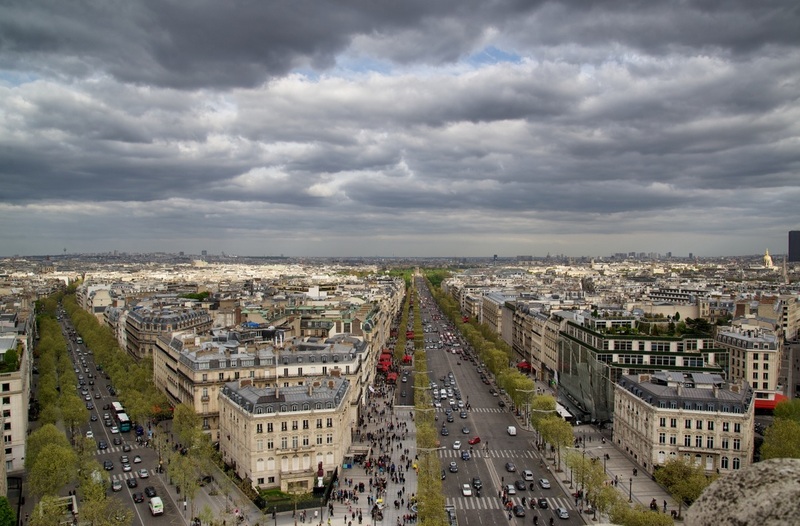 As the Arc du Triomphe is located at the top of the Champs-Elysees it offers views down the magnificent street and all the other streets that lead to it. You can see the Sacre Couer in the distance, the Lourve and the CBD further afield. The most important building in Paris is of course in full view right in front and close enough to get some really great photos. As with Notre Dame Cathedral, getting there early or later in the day will help you avoid the queues. And because it’s a national monument, it can be closed from time to time for special events. Visit this website out ahead of your visit to avoid the disappointment of it being closed.